When life gets busy, I've found that's a great time to read short stories. 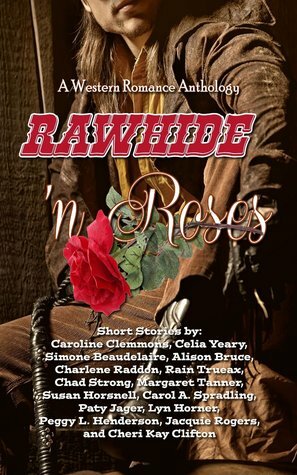 Right now, that means the book of choice is Rawhide 'n Roses, a Western romance anthology. This book features historical and contemporary short stories by some of my favorite authors (*listed below). So, when I need to take a break, I do as the Amazon page for this book suggests: grab my favorite drink, sit back and enjoy! Marshall Branch McCauley leaped from his horse and looped the reins over the railing of the stairway to the family's second floor living quarters. He took the steps two at a time. No matter what, he could not be late for his wedding; eight months it had taken him, after Jenna had finally accepted his proposal, to get her to name a date. "Jimmy John, put your gun to Jenna's head," he ordered. Once the boy obeyed Arch called out, "That you in there, McCauley?" There's more than one way to mine for gold, as May Travers well knows, and Marshal Ben Jessup is about to find out. Branch McCauley and Jenna Leigh-Whittington's wedding day arrives at last, so why is Jenna riding hell-bent out of town wearing her wedding dress and a gun belt? Something's up, and it doesn't look good. Will the wedding ever take place? A stowaway's past and future collide on the Santa Fe Trail. Here are the snow globes we created. You can find detailed instructions for making your own snow globes on quite a few blogs (just do a Google search for "Snow Globes Children's Craft"). Martha Stewart even has a how-to video. We used baby oil for the liquid inside the jars and glitter and sequins for the "snow." One observation: The jar with the gold lid sealed better than the one with the red lid, mainly because it required more twists to close it. I ran a line of hot glue around the rims of the jars before affixing the lids. My granddaughter also had fun gluing sequins to some painted wooden ornaments I had. We used Elmer's Glue on this one. The center of the ornament is supposed to hold a photo, of course, but she wanted to put sequins in there instead. Who am I to stifle her creative instincts? We had a great time, and my granddaughter was proud of her special Christmas crafts. Have you ever read a book where you weren't sure if you liked the main character? That's what I felt about the protagonist (Agnes La Grange) in The Mirror by Lynn Freed. Agnes was hired as a housekeeper, but after the father of the family where she worked installed a full-length mirror in her bedroom and she became aware of her beauty, she took full advantage of her assets. I admired Agnes's honesty with herself, her determination, and her ambition, but she was selfish and just not likable. Of course, that also made her story very interesting! I will say that the book kept me entertained and fascinated. Part of that was due to the setting: South Africa in the 1920s-1940s. I also enjoyed the way the story was presented - as a memoir, complete with photographs. It seemed real although it was fiction. In the books I read, there was nothing but joy in the hearts of the mothers, except when they weren't real mothers at all, but only stepmothers. And then it was all rage and fury, and the girls cowering under the rod or eating poisoned apples. But here was I, the real mother, and I thought, She'll not always be a child, and I'll not always be young and beautiful. And who will I have then but her? This is the story of Agnes La Grange, a beautiful young woman who emigrates as a housekeeper to South Africa in 1920. With a determination to make a future of her own and a love of men that does not leave her in desperate need of them, Agnes constructs a life beyond the conventions of colonial society. Written in her own fresh and unguarded voice, The Mirror is a fictional memoir, telling the story of the essential female, what she must do to survive, and how little the cost has changed over time. FYI: A friend recently cleared out some books from her collection and gave a lot of them to me. This book was among them. It was copyrighted in 1997, and there were no grammatical or other errors in the book to distract me. 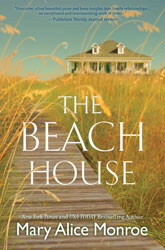 Today's post features The Beach House by Mary Alice Monroe. It's a beautifully written story about 40-year-old Cara and her mother who is dying of lung cancer. Cara goes back home to the barrier islands of South Carolina and while caring for her mother, confronts issues that have followed her since she was a child. Loggerhead turtles figure in the plot too, and I learned a lot about them through this story. Seems like a lot of the books I've been reading lately are set at the beach. Maybe it's time for a getaway to someplace warm! FYI: This book is part of a trilogy. It was twilight and a brilliant red sun lazily made its hazy descent off the South Carolina coast. Lovie Rutledge stood alone on a small, rolling sand dune and watched as two young children with hair the same sandy color as the beach squealed and cavorted, playing the age-old game of tag with the sea. A shaky half smile lifted the corners of her mouth. The boy couldn't have been more than four years of age yet he was aggressively charging the water, the stick in his hand pointing outward like a sword. Then, turning on his heel, he ran back up the beach, chased by a wave. Poor fellow was tagged more often than not. But the girl... Was she seven or eight? Now there was a skilled player. She danced on tiptoe, getting daringly close to the foamy wave, instinctively knowing the second to back away, taunting the water with her high laugh. Brett slowed their pace and the engine lowered to a bubbly growl as he expertly motored through the jungle of grass, his eyes on the bank, one hand on the rudder. It was like being Katharine Hepburn and Humphrey Bogart on the African Queen, she thought to herself. "Are we almost there, Mr. Allnut?" Caretta Rutledge thought she’d left her Southern roots and troubled family far behind. But an unusual request from her mother coming just as her own life is spinning out of control has Cara heading back to the scenic Lowcountry of her childhood summers. Before long, the rhythms of the island open her heart in wonderful ways as she repairs the family beach house, becomes a bona fide “turtle lady” and renews old acquaintances long thought lost. But it is in reconnecting with her mother that she will learn life’s most precious lessons true love involves sacrifice, family is forever and the mistakes of the past can be forgiven. Recently, our son generously offered to treat us to dinner out. 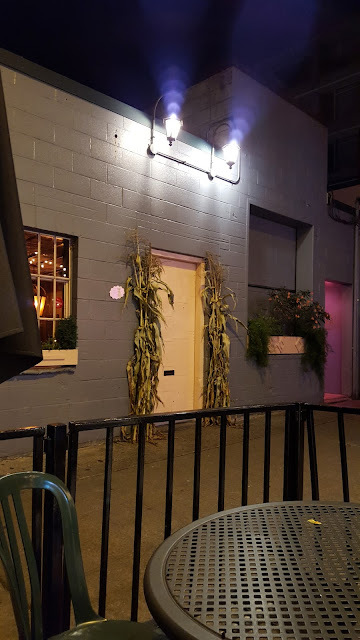 He said he'd act as chauffeur, and he knew just the place he wanted us to go -- The Pink Door Restaurant in downtown Seattle. He'd heard they had good Italian food, but the main attraction was the trapeze act! So we set a date and went. Unfortunately, I wasn't able to get a photo of the trapeze performer. She twirled and twisted high above the tables in the main dining room, and did her contortions while clinging to a length of fabric. Reminiscent of Cirque du Soleil. Amazing! However, here's a photo of the restaurant's simple exterior. You'd think the restaurant's entrance was the door lit with a pink light, right? Nope. It's the door flanked by corn husks with the tiny oval "sign" to its left. The restaurant is located in Post Alley at Pike Place Market. Here's the view from our table on the covered terrace. I couldn't believe someone was actually standing on that balcony, playing the guitar. Turns out it was a mannequin. 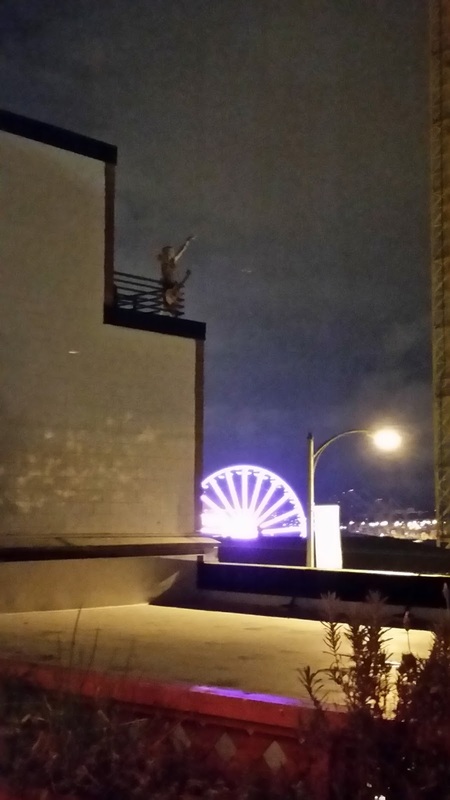 That's the Seattle Great Wheel on the waterfront in the background. By the way, the food was good. We took advantage of the Seattle Restaurant Week menu and had a three-course meal, paired with appropriate wines. A nice evening out. 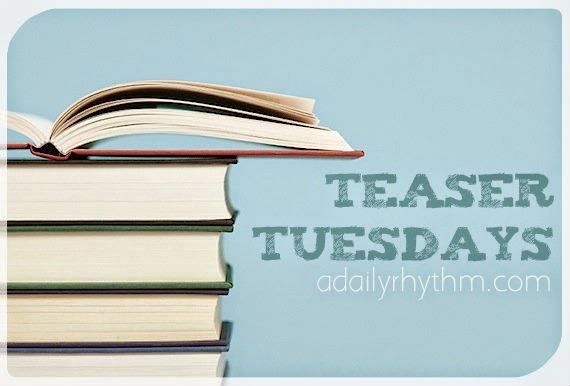 Several weeks ago I featured Skinny Dip by Carl Hiaasen on my Teaser Tuesday / First Paragraph post (here). It is definitely a book for adults. Today my excerpts are from HOOT by the same author, but this book is written for kids aged 10 to 15. It's a great story (Hiaasen's first children's book, written in 2002) and is fun reading for both kids and adults. As with all of Hiaasen's books, there's an environmental slant along with plenty of humor. In this story, the concern is for burrowing owls being displaced by construction of a pancake house. The sticker on the cover says: "Newberry Honor Book." Roy would not have noticed the strange boy if it weren't for Dana Matherson, because Roy ordinarily didn't look out the window of the school bus. He preferred to read comics and mystery books on the morning ride to Trace Middle. But on this day, a Monday (Roy would never forget), Dana Matherson grabbed Roy's head from behind and pressed his thumbs into Roy's temple, as if he were squeezing a soccer ball. The older kids were supposed to stay in the back of the bus, but Dana had snuck up behind Roy's seat and ambushed him. When Roy tried to wriggle free, Dana mushed his face against the window. "How would you and Mom like it," Roy pressed on, "if a bunch of strangers showed up one day with bulldozers to flatten this house? And all they had to say was 'Don't worry, Mr. and Mrs. Eberhardt, it's no big deal. Just pack up and move to another place.' How would you feel about that?" Unfortunately, Roy’s first acquaintance in Florida is Dana Matherson, a well-known bully. Then again, if Dana hadn’t been sinking his thumbs into Roy’s temples and mashing his face against the school-bus window, Roy might never have spotted the running boy. And the running boy is intriguing: he was running away from the school bus, carried no books, and–here’s the odd part–wore no shoes. Sensing a mystery, Roy sets himself on the boy’s trail. The chase introduces him to potty-trained alligators, a fake-fart champion, some burrowing owls, a renegade eco-avenger, and several extremely poisonous snakes with unnaturally sparkling tails. Roy has most definitely arrived in Carl Hiaasen’s Florida. I've just started reading this story, and it's entertaining so far. There's great tension between Emma and Colin. 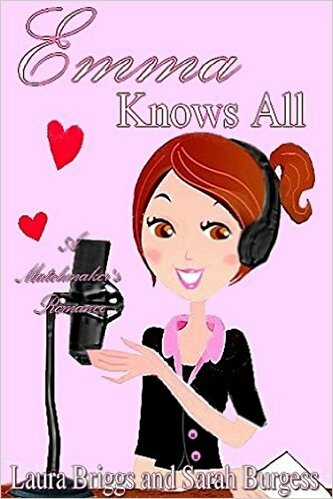 She's known as Dr. Emma, and she gives advice about romance on the radio. Colin is a psychologist who seems to be more comfortable working with theories than with actual people. "It's devastating, doctor. I can't get over it. I've tried I don't know how many times, but ... I keep failing." "It's okay." Em's voice was soothing. "Everyone fails sometimes. It's a part of life, Louisa. You have to keep that in mind, and you can't constantly beat yourself up over it." "But I feel like it's all my fault!" "...It washes away every sense of self, every shred of common sense. It leaves them an empty shell, or embitters them to the lowest levels, once they're rejected." A modern retelling of Jane Austen’s EMMA with shades of PRIDE AND PREJUDICE. Emma Benton—known as ‘Doctor Emma’—has a knack for advising the lovelorn and lonely on her radio show Heart Therapy. Em’s sympathetic manner and spot-on instincts provide the perfect answers, or so claims her boyfriend, the handsome and clever psychologist Frank, her producer Isabel, and her ever-expanding audience of listeners. But Doctor Colin Ferris disagrees. During a guest segment on Em’s show, he challenges her advice on the air and offends her personally in their brief exchanges. Rude and pretentious, he’s the last person Em would imagine as the author of a best-selling guide on being a gentleman in modern times. He’s also the last person she would choose to work with—but Fate makes that decision before Em can avoid it. In her worst PR nightmare ever, Em finds herself paired with Colin in a reality show quest to help a romantically-challenged young woman. Shy, awkward Harriet Smith needs more than just a little advice, but can two people so vastly different in their opinions really help her? As Em struggles to find common ground with Colin, she learns there’s more to him than meets the eye…and maybe more between them than opposing ideas about love.